Africa is catching up with us . . . here we are in a traffic stop . . . see the radar gun. Most places have a police officer stationed there on foot, signaling people to pull over. If you do, a ticket is yours. Praise God! Your prayers, our prayers, and those from all around the world have been answered. We have arrived safely in Kenya, East Africa. We were on a high from all help we received from our Kenyan Adventist family in getting all 27 bags weighing 70 lbs each off the baggage claim, through customs, and into a bus. Until you've managed that many bags you don't realize just how much of a project it really is . . . we really had to do very little. Getting through the border into Tanzania was a bit more difficult. After 24 hours we now have all our things. We were hot, tired, hungry, and shedding tears of joy upon reuniting with our team members. The first thing we did after a lot of hugging, was to offer up prayers of thanksgiving. And, now as we write this note to you, we're on to the next the next phase of our project . . . training laypeople to use technology to win souls. Thanks for your love and prayers . . . Continue to remember us! "Rachel Terwillegar please see British Airways in the middle of the hall" the BA representative barked out in a British accent. So I made my way to the magic spot expecting to find Curt and Carol Frembling putting their shoes back on at security screening. Instead I received a message that they could not check in until 6 hours later. No worries for us, we just had breakfast and surfed the Internet. Meanwhile Carol and Curt were cooling their jets in a mini restaurant. Imagine occupying a booth for six hours. They finally arrived . . . one more team member to locate -- Tammy in Nairobi. She gets in 4 hours before we do, so she will be the anxious one looking for us. As we made our way down the hall to the departing gate a young lady tried her best to get us to purchase tickets to win a Ferrari. While we put up this new stuff on the blog, our team leader, Viorel, spends his quality wait time in siesta. They say a short power nap is good for a person. So good on you, Viorel! The VERY NICE ticket agent took Viorel's money for the bag, $220! She was so very nice to us, what happened, Viorel? Meanwhile, we spent a few hours in the airport updating this blog. Viorel is as wicked with the camera as I am with the words on this blog. After a very long night, we are here in London. Carol paged me to let me know she and Curt are on the other side of security. They are stuck there for another couple of hours until they will let them check their bags. Carol and Curt came to London from Dallas, Texas, to Gatwick Airport. There they got ground transportation to Heathrow, and will continue on with us to Nairobi. Our cell phone doesn't work here, so she paged us with the update. It'll be another long night and we'll be in Tanzania. In London we met a very nice chap, Tap Dong, an Adventist, on his way to the Sudan to work with one of the pastors to open schools and churches. Tap has done quite a bit of work in the United States, as well as some education. We discussed many people that we all knew, that he knew. Small world, isn't it. He was wondering why we were not on our way to the Sudan as the work is opening up there. After getting to bed this morning at 3:00, we were up at 7:00, showered, and proceeded to finish packing. Good news came at 7:00 a.m. when Plan B was shortened a bit by some good news. Our plane doesn't leave until 8 pm something, but with 17 bags to check in, each weighing 70 lbs, we decided we would be better off cooling our jets in the waiting area rather than waiting in a long line. The unfortunate chap that met us at the airport didn't hesitate at his lot to help us with all those bags. He stayed patiently through the process with the TSA and even allowed us to get his photo. BA has a new excess baggage system. For some reason they were not able to process the charge for one of our excess bags. (The others were paid for online). Anyway, Randy, sporting his mosquito net hat, enjoys the news from the attendent, "Because you have waited so long I've asked my supervisor to waive the charges." That was the best hourly wage Randy has earned in quite some time . . . over $200. Later I told him that the agent reported she could not find two charges in their system for the bags I paid for online. She was quite sure BA would have to"eat" the $924, as we had a receipt. I hadn't paid particular attention to the receipt, but upon closer look there were two charges of $924 with a total of $924. 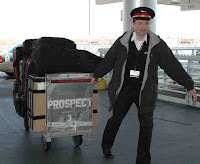 Meanwhile, Viorel Catarama shows up with 7 bags to check in and get his seat assignment. His bags looked like ours. (They had asked if there was anyone else in our group, so knew he would be coming along.) We had been there some time dealing with the payment of the excess bag, so knowing he was with us, they didn't even weigh his bags! 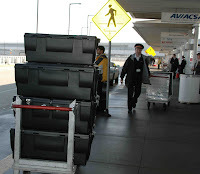 Unfortunately, however, not all the agents were having difficulty processing charges for excess bags. Here you see THE VERY NICE agent with his credit card. We didn't wait around to see if he got the same treatment we did. Will find out shortly whether or not his card gave their system a jolt like ours did! Tears filled my eyes as I read Tammy's post this morning. What fun we've all had putting together our things for the children of Twing Memorial School. It's going to be so much fun when we get there to meet each little one. Yes, Tammy, I can hardly wait to see you! Let's do breakfast in Nairobi. Less than 24 hours from flight time, our New Beginnings DVDs had not arrived. Learned that bit of news just my colleague ministerial director, Ed Barnett, was calling everyone together to pray for our team. Our God is the master of Plan B! All through the night Randy and I worked in the execution of Plan B. There are just a few more details to care for this morning! God is good, God is great! What is Plan B . . . you'll have to keep reading on to find out. Well, I have been one busy lady the last month and a half. When I decided that I would go to Tanzania with my parents, I started thinking about what I could take with me. The little school over there that is named in memory of my Grandparents needs many, many supplies so I began shopping in earnest. Some of the things I bought for the kids were an Australian decorated pencil each, coloured pencils, pencil sharpeners, 5 soccer balls, and 5 rubber balls, with a pump and extra needles. Also, the school my two boys attend had 2 big boxes of used school uniforms they were given for charity. They said I was welcome to have them if I wanted to pay for shipping them. There were tugs on my heart strings as I went through all of them and realised that there were not going to be enough for every child to have one. But some are better then none. I found school exercise books for 5 cents each, as our “back to school” sales were on here in Australia, and I bought 420 of them. Two for each child and a few to spare. It just about broke my heart when my boys brought home over 10 exercise books each for me to cover for their school year. I knew there was no way I could manage buying, much less shipping, over 2,000 school exercise books for the little kids there. And then the reality of mission work hit me. If I only bring two books each, the kids will have only two books each. Every thing I do, or don’t do, makes a difference in these children’s lives. I started noticing all sorts of things that I would love for the little kids to have, like school backpacks and lunch boxes, school uniforms, little toys; all things that I would not think twice about buying for my kids just for fun. I often got teary eyed while shopping. After I gathered all the gear I realised that I was not going to fit it all into my suitcase. I had four times the weight I was allowed. So, I had to call a shipping company that specialises in excess baggage. I sent three boxes last week, and after they had gone, I started to panic. I was definitely going now, or else the things I had so carefully packed would have no one to pick them up! To take my mind off travelling internationally alone for the first time, I started planning the song services for the conference we are going to. First I asked the pastor there if the people sang in English or Swahili. He answered that they sing in Swahili, but I would lead out in English. This worried me a little. I was not interested in singing five solos before each meeting. So, I called my Grandmother who lived there for over 30 years, and asked her to give me a list of songs that people would know. We had a lovely chat, and she assured me that they sometimes sing in English as well. When we had finished our talk she told me, “Thank you so much for calling, please do it as often as you can because it doesn’t cost me a cent.” Then she giggled. She is a funny lady. So then I got one of my dear friends, Leah, to record backings to the hymns. We had a good time trying to work out how to get midi files off the electric keyboard and into my computer. After they were done I had 17 hymns to make power points for. That took me a while as I had no experience in using power point. I do now! So…it is the day before I go. I will miss my husband and my boys so much, and I worry about whether or not they will wear the right uniforms on the right days, and whether or not they get their homework done and handed in on Fridays, and whether or not they remember to take their swimming gear on the right day. Good thing my mother in law is coming to help Luke out. But I am excited as well. Can’t wait to meet you in Nairobi, Mom! 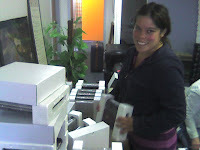 Finally the magic little devices, DVD players, the new evangelistic tools for laypeople in Africa have arrived. They've been prayed over for many weeks. Prayers for wisdom in locating just the right unit, taking things into consideration such as a different power source, different signal (NTSC vs PAL whatever that means). After all those prayers it didn't seem to nevermind that it was snowing in the bitterly cold, frigid Midwest. Now to pack them for their journey to Africa. More prayers are needed -- we need to get them through two country borders, customs and all . . . and secure them until training sessions begin. Oh what fun! Special thanks to my sis, Soni Macy; Duane Rollins, treasurer; and Kyoshin Ahn, executive secretary, Illinois Conference. I smiled and gave encouragement to all as the 75 boxes were unloaded. Yeah, yeah, someone has to do it! It's Sabbath . . .
How can anyone survive without the Sabbath? I, for one, am so happy for this day! One whole day to relax before the final push in getting all the last minute details accomplished. And, we have one day to seek the Lord in prayer to seek His blessings in our work. All our cares have been placed on Him. Those cares include concern for good weather after the frigid temperatures and the relentless snow this past week; concerns over getting 20 excess bags of 70 lbs each to the airport and checked on their way (weight-size limitations, etc. ); our concerns over potential health issues while on our trip; making our connections on time; meeting those we are scheduled to meet along the way and at our destination; presenting materials we've never presented before; conversing with people of a different language; and the list goes on. Yes, we're thankful for this awesome journey . . . while we rest on the Sabbath, here are a few photos of some of the blessings we expect to receive in Tanzania. We've been told we must take new money with us to Africa . . . it can't have ink marks, be torn, or defaced. They just won't take it in Kenya or Tanzania. We've discovered that banks do not have many new bills of the denomination we needed. After going to several banks we finally found one willing to hunt through their cash for a few "good ones." We've learned one thing in preparing for this trip. There are some surprising challenges each step of the way. We'll be better off because of them . . . and do appreciate the counsel of those who have gone before us. Look at all the kids in this brand-new school. There are more than 200 students in four classrooms. We wanted to do something special for each student. I had seen in a local craft store t-shirts for $2.00 each. Wouldn't these kids look terrific in a t-shirt with the name of their school? Screen printing 200 t-shirts is a lot of work, so while visiting my son, James A, Twing, II, in Houston, Texas at Christmas, I searched online for printed t-shirts. Unfortunately everything I found started at close to $6.00. Well, I thought, perhaps if I could get them from someone in Chicago, they would be a bit cheaper. So I Googled "Chicago screen printers" and called a few companies. I told them about the school and my desire to take T-Shirts for the children. The price was the same at the first number I called. At the second number it sounded like I interrupted a luncheon appointment, but I continued with my story. "Oh, I have some t-shirts in my warehouse," came the reply. "I'll give them to you for the cost of printing them." What a deal! I sent her some photos and over the next few weeks we kept in touch via e-mail. Yesterday my sister picked them up for me. They are beautiful to say the least. It turns out we needed them for more than just the kids. We're placing them on the top of our luggage to discourage theft at the other end of our journey. How can we say thank you enough for this love gift? This woman didn't know us, but responded to the need. Please, please, if you need t-shirts for any event, contact Nancy Pierce at tshirtbroker.com. Here is a photo of mys sis, Soni Macy, packing T-shirts on the top of our luggage. Randy at the sharp end of the needle! Saw Dr. Jesse Park of Willowbrook a couple of weeks ago for shots. Didn't know at the beginning how many shots we'd need to do this trip. Whew, almost broke the bank! Dr. Park is such a sweetheart. After learning that we are taking school supplies for the kids of the Twing Memorial School and seeing their photo, he whipped out some cash, "Will this help? he asked. Here he is with Randy at the sharp end of the needle! Before we get too far into this blog we need to introduce you to Pastor Musa Mitekaro. He's the individual who set everything up and invited us to see his beautiful country. Musa is one of Mama's kids. He was 14 when he came to her home. She saw great promise in him . . . by the time he was 16 years old he was preaching the gospel and winning souls for Jesus. We're going to ask him how many . . . he probably won't be able to answer that question! Musa has a bachelors degree, and his masters which was earned in Germany. He is a Seventh-day Adventist pastor of 20 churches with 15,000 members, and he teaches college at Tanzania Adventist University in Arusha. He has 24 laypeople working with him in ministry. People in the United States help with their salary of $40 each per month. Yes, you read that right! Many of them will receive the DVD players and the New Beginnings Bible Study lessons. Right now Musa is arranging the photo copy and assembly of 25 lessons of 25 pages each, along with translating another 30 pages. All this material will be given to each of the 300 taking our training. Earlier this year Musa visited us in Chicago. 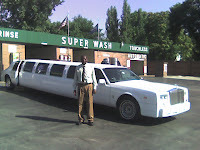 Don't believe he had ever seen anything quite like this Rolls Royce limo. At the annual meeting of Adventist-Laymen's Services and Industries (ASI) in Dallas, Texas, we had a booth on the work in Tanzania. Musa met Mark Finley, former director and speaker for the It is Written ministry. It was at ASI that we learned officers would be training laypeople in the use of DVD players and New Beginnings Bible lessons all over the world. Yesterday Adilio and Ingrid Herrera came over to help us get ready . . . Ingrid sprayed all our clothing with Permanone so we won't get bit by mosquitos. Here's hoping it works. Team members Carol and Curt told us a group from Keene, Texas just returned from Nairobi, Kenya -- three of them got Malaria. We're going to do everything we can to avoid the big M. I've warched over the years as Mama Twing struggled with the disease when she was exhausted from her travels. This morning I packed all the sprayed things . . . and more. Hopefully they will all arrive with us! Pastor Musa says it is very hot . . . and at one of the places we want to visit it is raining. Here in Chicago it is 10 degrees below zero with a foot of snow on the ground. Global warming???? Even though we now have 6 bags carefully packed and weighed . . . there's many more to do. Friday we'll go at it again. Ingrid helped for four hours on Friday. Bless those helping hands! Here she is unpacking to re-pack one of our many bags. Years ago Dr. James A. Twing and his wife, Ethel, left their comfortable home in the United States "For Tanzania" East Africa. There a few short years, the doctor gave his life to save an African man. The new widow returned to the United States to obtain her nursing degree, with the idea she would return to Africa where she lost her dear husband. Return she did! At over 50 years of age, Ethel spent the next 30 years of her life not only in service at Heri Mission Hospital in nursing, but also in building churches and educating African young people. It is because of the service of my in-laws that I inquired about the possibility of serving on a mission trip there. We've been invited to come to Africa to train laypeople in Tanzania in the use of DVD players to give the New Beginnings Bible lessons. A joint project with Adventist-Laymen's Services & Industries (ASI), there are six of us on this team. Viorel Catarama, vice president for evangelism, is in charge of this part of the project. Rachel Terwillegar, that's me, development director for the Seventh-day Adventist Church in Illinois, Viorel's assistant. Randal Terwillegar, my husband, a high voltage test technician for MCL in Bolingbrook, my very able assistant. Carol Frembling, charge nurse in the emergency department of Huguley Hospital in Dallas, TX, keeping us all well. Curtis Frembling, Carol's husband, a retired physical therapist, who along with Randy will do the hefty stuff. Curt may also do some welcome physical therapy should our adventures include exercise of which we are unacustomed! Tammy Twing Pannekoek, granddaughter of Dr. & Mrs. James Twing, joins us from Sydney, Australia. Tammy will sing for our meetings. Viorel will leave us after the training sessons have been conducted to return to the United States. His day job requires some of his time so he will return to his work building homes in Hinsdale, Illinois. Viorel also has alot of work yet to do in setting up other training sessions around the world. The rest of us will travel on to Twing Memorial School. We plan to have a ton of fun there with the children at the school. We will be bringing supplies for the school and personal items for the kids. After our visit to the school we plan to spend some time in several of the game parks, shooting the animals with digital cameras (still and video)! All along the way Tammy will be interviewing the more than 100 people who have been educated by Ethel Twing. Tammy will be collecting all this data to begin her first book about a little woman who has done so much. Hang in there with us as we recount the experiences of this adventure "For Tanzania."